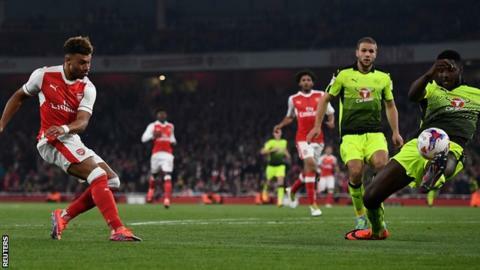 Alex Oxlade-Chamberlain scored twice as Arsenal extended their unbeaten run with a hard-fought EFL Cup win against Championship side Reading. The England midfielder opened the scoring when he skipped into the box and drilled into the bottom corner. Reading almost equalised when Callum Harriott's deflected shot landed on top of Emiliano Martinez's goal. Arsenal dominated after half-time, with Oxlade-Chamberlain's deflected shot completing a 14th game without defeat. Oxlade-Chamberlain, 23, has struggled to hold down a regular starting place in Arsene Wenger's first-choice side during their fine start to the campaign. He has completed 90 minutes on just two occasions this season, but staked his claim for a bigger role with the standout performance in a much-changed Arsenal team. While there was little to remind the Emirates Stadium crowd of Arsenal's memorable 7-5 win when the teams met in this competition in 2012, it maintains the Gunners' hopes of winning the League Cup for the first time since 1993. Reading acquitted themselves well for the most of the contest, but were put on the back foot when a sloppy pass from keeper Ali Al-Habsi allowed Oxlade-Chamberlain to win back possession high up the field and then open the scoring. Al-Habsi partially redeemed himself with several saves after the break, but was powerless to stop the second which deflected off Royals defender Jordan Obita to seal victory. "Alex has looked nervous in front of goal and now we hope this will build his confidence. "He has been working really hard in training. That is now showing on the pitch. "His concentration and his focus have improved, he is much sharper and he will continue to do well. "(To start games in the Premier League) he needs to keep playing like that." "I think we tried to get the result but, playing Arsenal, they have quality in a very big squad. "They can make it very hard and that is what they have done today. "We wanted to push them up and make chances. We have done it a couple of times but then sometimes we gave the ball away as well. "It is a very good team, we knew it wasn't going to be easy. "We wanted to win but I think the players need to learn from (that game) to improve their chances going forward." Match ends, Arsenal 2, Reading 0. Second Half ends, Arsenal 2, Reading 0. Attempt missed. Mohamed Elneny (Arsenal) right footed shot from outside the box is too high. Carl Jenkinson (Arsenal) wins a free kick on the right wing. Attempt missed. Stephen Quinn (Reading) header from the centre of the box is close, but misses to the left following a corner. Corner, Reading. Conceded by Kieran Gibbs. Attempt blocked. Dominic Samuel (Reading) right footed shot from the centre of the box is blocked. Attempt saved. Yann Kermorgant (Reading) right footed shot from outside the box is saved in the top centre of the goal. Dominic Samuel (Reading) wins a free kick in the attacking half. Substitution, Arsenal. Gedion Zelalem replaces Alex Oxlade-Chamberlain. Substitution, Reading. Stephen Quinn replaces Joey van den Berg. Olivier Giroud (Arsenal) wins a free kick in the defensive half. Liam Moore (Reading) is shown the yellow card for a bad foul. Goal! Arsenal 2, Reading 0. Alex Oxlade-Chamberlain (Arsenal) right footed shot from outside the box to the top left corner. Assisted by Olivier Giroud following a corner. Corner, Arsenal. Conceded by Ali Al Habsi. Attempt saved. Alex Iwobi (Arsenal) left footed shot from outside the box is saved in the top centre of the goal. Danzell Gravenberch (Reading) wins a free kick in the attacking half. Alex Oxlade-Chamberlain (Arsenal) wins a free kick in the defensive half. Attempt saved. Alex Oxlade-Chamberlain (Arsenal) left footed shot from the centre of the box is saved in the centre of the goal. Substitution, Arsenal. Chris Willock replaces Lucas Pérez because of an injury. Delay in match Lucas Pérez (Arsenal) because of an injury. Attempt saved. Olivier Giroud (Arsenal) header from the centre of the box is saved in the centre of the goal. Corner, Arsenal. Conceded by Jordan Obita. Lucas Pérez (Arsenal) wins a free kick on the left wing. Foul by Danzell Gravenberch (Reading). Substitution, Reading. Danzell Gravenberch replaces Tennai Watson. Foul by Carl Jenkinson (Arsenal). Substitution, Arsenal. Olivier Giroud replaces Jeff Reine-Adelaide. Corner, Reading. Conceded by Jeff Reine-Adelaide.